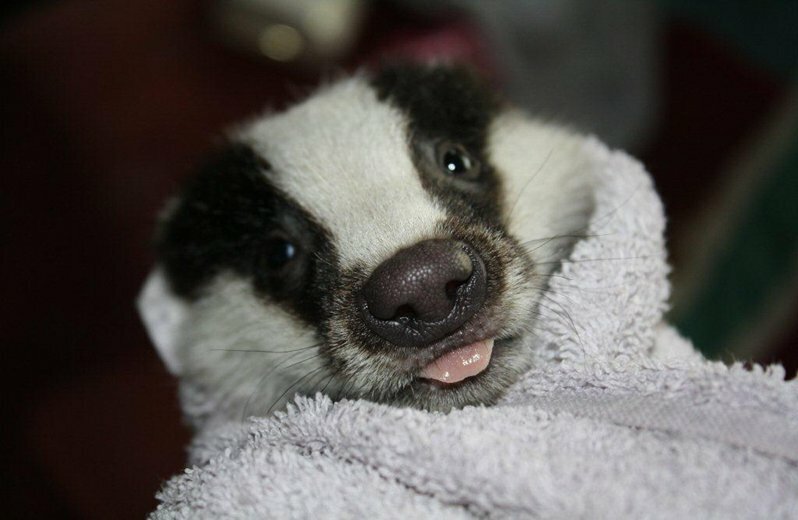 On our opening page we’ve shown you Roisin the badger cub. Obviously she was the only survivor of her clan. What became of her siblings? Presumed dead. And mother? also vanished, possibly yet another victim of the Department’s trappers. In response to Badgerwatch’s request, the Department of Agriculture, Food and the Marine (DAFM) revealed yet another 7,000 badgers were culled in 2012. To date, Ireland’s longest running ‘soap’ has cost the lives of approximately 96,000 badgers. The exact number of badgers killed illegally on some Irish farms is unknown but is regarded to be significant. We have also lost the progeny of the above ‘casualties’ which would have stabilised our badger nation. Thousands of badgers were killed in the East Offaly Badger removal Project (1989) and its successor the Four Special Areas Project (1997). In it’s submission to the Bern Convention In 1999, Badgerwatch pointed out that these trials may well be the start of an all-out eradication assault on the species. This was emphatically denied by Agriculture in their response. Sadly, time has proved us right. Badgerwatch’s second request to Bern for a closed season on snaring merited the following response from our Government. “The only regions in Ireland where badger numbers have been significantly reduced are the Four Special Areas and an area in East Offaly. In total these amount to less than 2% of the landmass. No further large-scale high intensity population reductions are envisaged and as such there is no area where the local population is endangered”. Weasel words indeed. The most ferocious of culls was negotiated in 2000 and agreed under the terms of a social document, the Programme for Prosperity and Fairness (PPF). Extra manpower was brought on board to ensure few badgers would escape the snare. The cull began in 2004 and should have finished in 2008. Not so. The killing continues unabated. We have seen hedgerow after hedgerow containing badgersetts long bereft of occupancy, a standing testament to the enthusiasm of the Minister’s badger killers. No threats of redundancy here, the jobs are safe even with the eventual arrival of the promised vaccine. Bleak years still ahead for Irish badgers and their friends. Beware, horrible story overleaf. what some call sport ! Badgerwatch will not publish the source of the written account for obvious reasons. “On Saturday 2nd February I received a call from concerned neighbours who heard a lot of shooting around the locality. This is in a beautiful part of the mid-lands. It is an amazing location, used daily for walking the dogs as it is secluded with lots of forestry. With every positive comes a negative and that would be that the area is utilised by hunters quite a bit and these also live in the general locality. When I was told that there was a lot of shooting I advised the neighbours not to go to the area alone and that I would meet and accompany them. When we got to the location there were no vehicles around but lots of tracks. I parked a little up the road and as I walked I noticed something in the distance. 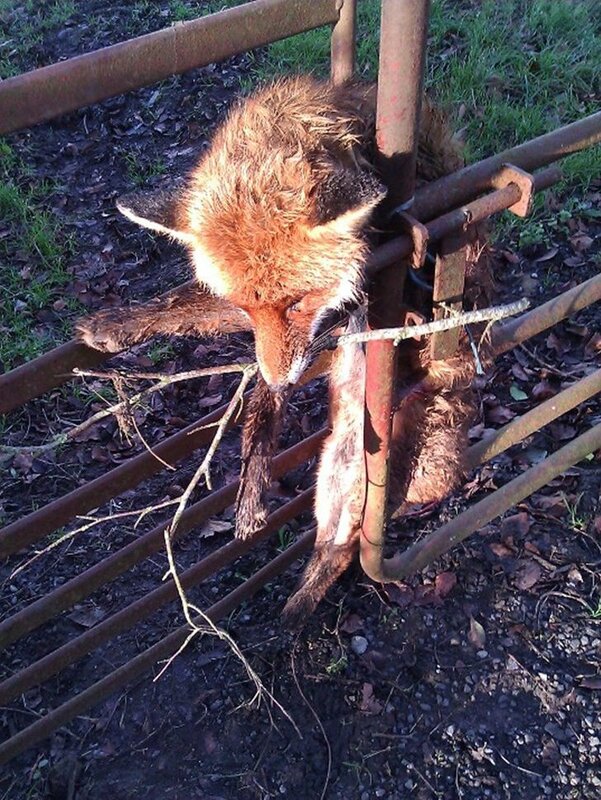 On closer approach, I realised that it was a fox tied to the gate with blue twine. He had been lodged between two gates and then tied. I asked my neighbours to go home at this point, as they are older persons and animal lovers also I was fearful the hunters may still be in the location. On closer inspection of the fox, it was apparent he was dead and there was a clear bullet wound on his side. As I looked a closer I noticed that there was a (?) red cable also tying the fox to the gate and then to my horror I realised it was not a cable at all but the fox’s tail. It had been skinned to remove the brush no doubt as a souvenir. I have no idea of the significance of the stick in his mouth. My only hope is that the creature was dead before they removed his tail and that the stick was not used as a gag to stop him biting the hunters as they performed the final barbaric act. It was difficult but I took as many photos as I could conscious that I needed to get out of the area for my own safety also. I removed the fox from the gate and placed him on the ground and took some more photos. I then wrapped him up and placed him in my car to be buried. I couldn’t save him. I was too late but he was at least given a dignified burial. I have lived in the country all my life, I have been involved in animal welfare for more years than I care to remember but what I witnessed Saturday will stay with me for a long time. It was horrific...........it was murder. I cannot do anything about the fact that it may be legal to shoot foxes, shooting is one thing, the pure acts of evil that were done to this creature were nothing short of sadistic”. Nature has proved once again that the hand of man is still trying to find its niche in the natural cycle. Reports have indicated that a revival of the red squirrel population is underway as the range of the grey squirrel is being curtailed by the resurgence of the pine marten. This animal appears to be acting as a natural brake on the grey squirrel population thus reducing the impact on the red squirrel. For years Ireland’s shooting lobby have lectured to genuine conservations that grey squirrels were a threat to red squirrels and that the only solution was a wholesale slaughter against the greys. Now we find that a natural predator, who has also suffered at the trigger fingers of Ireland’s gunners, is now doing the job of grey squirrel control in a natural way. So the shooting of grey squirrels on the dubious grounds of animal control is rendered obsolete. Therefore it can be seen in its true incarnation as an outlet for those who need to fire bullets into wild animals for entertainment. The poverty of the argument that the shooting lobby has a role in countryside conservation is further exposed by the current clamour within this lobby for the pine marten to be stripped of its protection under the Wildlife Act and for it to become a non-protected animal. Thus allowing this animal to be hunted using fair or foul means. Anybody who attaches the epithet of vermin to a pine marten, one of our rarest and beautiful wild animals, really is a cretin. Wildlife is well versed in balancing the relationship between the species. It is the arrogance of man who believes that somehow they can tame and control nature that has a negative impact on the workings of nature. A start on allowing nature to do it work in its natural way would be to remove all form of live hunting from the countryside. Maybe a cull on the hunting community would allow the natural balance in the countryside to return. A keen hurler knows he can’t afford to take his eye off the ball, for it is then that his opponent may strike. I hope this isn’t happening to us right now as a nation. Amid all the great debates about austerity, banking collapses, and the multiple political upheavals convulsing Europe, our collective attention may be deflected from a looming ecological catastrophe. Not a gargantuan oil spill, a sudden widening of the Hole in the Ozone Layer or potential hazards posed by gas pipelines. No, the danger we face arises from a threat to the humble bee. The vital pollinating role of bees and other insects in agriculture is scientifically proven. Most of our food is dependent on that process, with the bee a major contributor to pollination. But certain pesticides now threaten the future of healthy bee populations and therefore that of agriculture itself and European food security. They are being poisoned by highly toxic pesticides called neonicotinoids. Other insect repellents, while not killing them outright, can induce adverse physiological effects, disturbance to their foraging patterns, and interference with feeding behaviour. Last month, the European Commission proposed a ban on three pesticides known to be especially harmful to bees and other essential pollinating insects. The proposal failed to achieve sufficient support to be approved and will again be voted on in late April or early May. In the meantime, the pesticide giants are waging a lavishly funded campaign to dissuade EU member states from backing the ban. They have enormous resources at their disposal and the services of the best PR firms that money can buy. The bee has been a friend to humankind for millennia. It occupies a special place in the folklore and literature of almost every nation. Yeats rhapsodized about building a “hive for the honey bee” in one of his great poems. But for all their proven worth to us humans, and their complex societal structures, the bees may not be able to withstand the ravages of human greed and ignorance. In the coming weeks the corridors of power in Brussels and Strasbourg will undoubtedly become hives of activity as the lobbying intensifies. I hope that TDs won’t make a bee-line for the Dail Bar when Deputy Clare Daly attempts to raise this issue after the Easter Recess. I believe it’s too serious for that. I also hope that Ireland’s Agriculture Minister Simon Coveney will not capitulate to the enormous corporate pressure being brought to bear on governments by the pesticide lobby. He should instead act to safeguard a most precious natural resource by siding with the modest but ecologically indispensable bee. THE FIRST year of the Welsh Government’s badger vaccination programme is a significant, science-led step forward in the complex long-term battle to combat bovine TB, says the Badger Trust. “In England the Coalition had a choice: cull or cure. In the face of overwhelming public and independent scientific opposition, it chose cull and confrontation and appears determined to go ahead with a mass, uneconomic slaughter which promises at best a meagre 12-16 per cent return over nine years. “In stark contrast” comments Trust chairman David Williams, “the Welsh Government accepted scientific advice and opted for vaccination. Encouragingly it is also introducing additional cattle control measures from April 1 as part of its wide-ranging measures to combat bovine TB”. Carried out over an area of 242 sq. km, mostly in north Pembrokeshire, but also in small parts of Ceredigion and Carmarthenshire, in one of the wettest summers on record, the first-year project cage trapped and vaccinated 1424 badgers “without incident or injury” and the Welsh Government’s summary report  confirms that it plans to expand the project where possible to increase coverage in future years. David Williams added: “Everyone agrees that there is no quick fix to bovine TB. The Coalition’s projected bTB reductions achieved by slaughtering tens of thousands of badgers, most of them healthy, are meagre and speculative and will take the best part of a decade. The preferred culling method—shooting at night—is unproven, potentially hazardous, will spread BTB through perturbation, and seems certain to provoke confrontation, and is widely seen as a politically motivated decision. Welsh Government’s Bovine TB Eradication Programme IAA Badger Vaccination Project Year 1 Report. Queen guitarist Brian May said the experience of badger culling in Ireland has shown that the process does not work. Queen guitarist Brian May has described the Irish policy of culling badgers as “utterly laughable” and has vowed to help those opposed to the practice in Ireland. Badgers will be intensely culled for 25 years to battle bovine TB and farmers will eventually be allowed to shoot them, according to DEFRA secretary Owen Paterson. In a frank interview with The Sunday Times, Mr Paterson said if the two pilots culls this summer were successful, 40 more cull zones will be created over the next four years. "We want to reduce the incidence of disease [bovine TB] to less than 0.2% of herds a year," he said. "It will take 20-25 years of hard culling to get to that. "If the two pilot culls this year are declared efficient, safe and humane, we will definitely be extending them. We will roll out 10 new cull zones next year, and 10 more in each of the three years after that." Six-week government pilots in west Somerset and west Gloucestershire to test the "safety, efficacy and humaneness" of culling badgers using a combination of free shooting and trapping and shooting could begin any time from 1 June. In total, around 5,000 badgers will be culled in the pilots. If they are successful, more cull zones will be created in Dorset, Devon and Cornwall and other parts of the West Country, where bovine TB is spiraling out of control. This could see the death of 100,000 badgers, which are a known reservoir of TB, in a bid to curb the disease. In the mid 80’s procuring a licence from Parks and Wildlife to snare badgers was not an easy task. In the meantime, here in Ireland, things have changed dramatically. According to a previous Agriculture Minister, no less than 6,000 badger snares are set across farmland every night. Fact is now there’s hardly enough badgers to fill them! But, the killing goes on. Does anyone really know why? Almost three decades of killing close on 100,000 badgers has done very little in the way of solving the BTB problem. The very modest drop in BTB levels fails to justify what has been described as “Slaughter masquerading as science”. Surely there are lessons to be learned here. It is incredible, to say the least that the penny has not yet dropped on the other side of the Irish Sea. The battle was lost when snares were laid for the first of the ‘Scientific Research Programmes’. There was no outcry from an indifferent public. Politicians of varied colours, ever conscious of voting power in their rural constituencies decided to play it safe and not rock the boat. A faithful few stood their ground. Little attention was paid when relevant non-badger killing strategies such as bio-security, cattle movement controls and pre-movement testing arose. The future of the badger hangs in the balance. If there is a future! When the dust settles and the last snare is pulled from the ground and the oral-uptake vaccine has been a resounding success, what then? Will it halt the illegal killing of badgers on some farms? Probably not. The mistrust of science is likely to linger in rural Ireland. The years of demonising the badger by our Government has done the job. It will not easily be forgotten. How can one blame up an coming generation of young farmers who will be forever fearful of having badgers on their land? Badgers are bad news. Hopefully, we still retain the farms where badgers will be allowed to live out their lives in peace, undisturbed. Let’s hope there’s enough to sway the balance in Brock’s favour. Friends of the badger have suffered untold anguish and heartbreak over the years witnessing the decline of the badger. The last thing we now want to see is a repetition in England. We know only too well what it’s like.